George Stephanopoulos opens the segment by reading a tweet from President Trump in which he states that the Nunes memo vindicates him and that the witch hunt is an American disgrace. Clearly the Democrat strategy is now to shift the focus away from the illegal FISA warrant their accomplices in the FBI and DOJ secured and to the drunken comments of someone they can freely vilify and discredit, assigning him with much more stature and influence than he actually had. The slimy Schiff says, “It actually began with George Papadopoulos, as if he were conducting an illegitimate investigation of himself. Schiff describes Papadopoulos as “someone who was meeting secretly with ‘the Russians’ and talking about the stolen Clinton emails. He then makes a strained effort to contort that premise into “the issue of collusion,” which still is not a crime, even if it were true. It is an accusation of mere claims of having simply met with Russians, not a crime, and talking about the Clinton emails, also not a crime. The only Americans not talking about the Clinton emails at that time were those trying to cover up her espionage inside the FBI and DOJ. Schiff completely dismisses the failure to inform the FISA court that Hillary Clinton paid for the fictitious information that they were presenting to obtain the license to spy, claiming bizarrely that it was not relevant, that a statement that a political player was involved was sufficient, and that it was more important to the court to be informed of what Christopher Steele knew. Of course the dossier has now been proven to be a work of fiction and that Christopher Steele knew nothing, just like the FISA judges who weren’t told he was writing the assertions they would base the issuance of a warrant on as a smear merchant contractor employed by Hillary Clinton. Schiff points to his efforts to obstruct and delay the release of the memo and give the guilty parties at the FBI and DOJ an opportunity to dilute the information contained within it being denied as proof that it was not an exercise in oversight but political. He’s a master contortionist, able to twist reality into his false narrative with great dexterity. 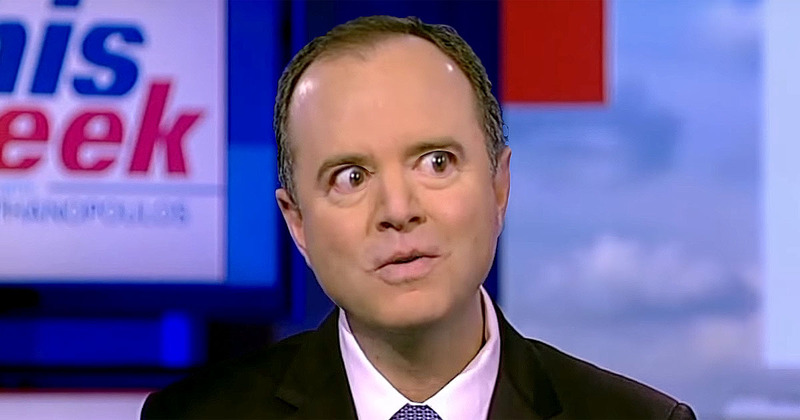 Bobble Head Schiff claims that the Intelligence Committee, who has been engaged in their own witch hunt for over a year, doesn’t know if the FBI has made any mistakes because they haven’t had the opportunity to invite the FBI in to ask them. Of course they had McCabe, Comey and others before them in hearings on multiple occasions, but that was before they were caught red-handed. He hasn’t asked because until now their focus was on keeping the wraps on the Obama regime’s criminal wrongdoing. It is only due to the release of the Nunes memo that the discussion is even taking place. Schiff and Stephanopoulos then go into a backhanded obstruction accusation against Nunes for informing the American people of the corruption that is ongoing at the DOJ and FBI, part of his congressional oversight duties. This vile sub-human and his communist Democrat comrades are attacking the very fabric of this nation with backwards “logic” and proclamations that good is evil and protecting and serving our nation first is criminal. Justice needs to come to him and the rest of the criminal Democrats, including Obama and Clinton, and it can’t come fast enough. You guys think it’s great that Washington is so full of back stabbing swamp creatures. I don’t know who got to Gowdy, but he has joined the slimy ranks of the Obummer gang. Then there’s McCain blowing his back stabbing mouth off constantly about things that don’t concern him. He helped get the FIFSA permits in the first place. Another ship jumper. What a “hero”. More like a disgrace. Us “deplorables” need to be told what to do to help the President get rid of this scum. At least the President wants to rid us of the Syrian recruits of Obama. That’s one good thing. i just WANT TO SEE INDICTMENTS handed down on ALL THOSE TRAITORS AND CRIMINALS AT DOJ, FBI, STATE DEPT, AND OBUMMA THE MUSLIM FRAUD AND CLINTON. everything else UNTIL that happens is just POLITICAL BS. These crooks spin and spin, and they obfuscate until everything eventually just goes away with the old there is nothing unlawful.